Last year during this challenge I read through the entire Anne series again. Each year I host this I run into someone somewhere who has yet to read Anne and every year I resolve to fix this for at least one person. 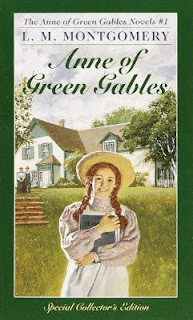 I picked up an extra copy of Anne of Green Gables - the first book in the Anne series - to give away to one of you. To win? Simply leave a comment below. (If you are participating in the Lucy Maud Montgomery Reading Challenge and have written up and linked to the post telling me so, please feel free to leave an extra comment.) This contest is open to U.S. and Canadian residents and will be open through Thursday, January 12th. THIS CONTEST IS NOW CLOSED. THE WINNER (as selected by Random.org) IS #6 - Karen K. Congrats! We are currently reading Anne to my 9yo daughter at bedtime. And she received the Focus on the Family edition of the book on CD for Christmas. So she has been listening to it during craft time. Cool giveaway. I love Ann of Green Gables. I can not wait to read this book to my daughter. I have listened to the audio book twice and loved it. Plan to read it to my boys this month as a part of the challenge. Would love to own a copy! I've never read this book and would like to.